There’s so much to love in this kitchen designed by Garrison Hullinger out of Portland, Oregon. 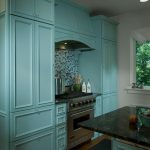 The cabinets painted Benjamin Moore HC-120 Van Alen Green are just so, so pretty. The colorful suzani rug, the narrow island, the La Cornue range and oh-my-word that chandelier are all just the mouth-watering icing on top! Check out more of this 1901 remodeled home over here! I’m so happy it’s Friday, which means it’s time to head to sunny California for the Design Bloggers Conference! I couldn’t be more excited to meet and learn from all of the talented people attending and speaking…it’s going to be such a great experience! (Plus I hear they don’t have snow in LA!) I won’t be back until Wednesday night, but hopefully I’ll find some time to sneak in some posts while away! Have a great weekend guys! This is one of my favorite kitchens ever! I've spoken with the designer before and he's a very kind and talented man. This kitchen is like a dream! I absolutely love la cornue ovens. Adore. It is the little details of this turn of the century house that really get me … specifically the bead board ceiling! How amazing is this??? My favorite kind of sink and range in the world all wrapped up in a pretty blue green "bow". Wow, thanks for sharing!! I become a follower, maybe you would like to follow me? I'm in LOVE with this kitchen! Fantastic! Great kitchen! Love that faucet! Do you happen to know who it's made by? Gorgeous post as usual. Enjoy your trip and the conference! Have a nice weekend. That kitchen is gorgeous. The color of the cabinets is perfect! I'm off to check out more of it. I live in California. You may want to pack some warm sweaters and a raincoat. Maybe you'll bring some sunshine with you! Have fun at your conference. OMG, that kitchen is stunning! Wow that kitchen is gorgeous. I love the darker trim. I want to see more of the tile behind the stove! Going to see more…. Beautiful kitchen! The suzani rug is a great contrast against the cabinet color. For my kitchen reno, marble countertops and la cornue stove is definitely on my wish list! Have a great trip to CA. Every now and then you post a picture that just makes me swoon…this kitchen is one of them!!! What a lovely color! HAve a great trip, wish I was going! 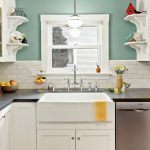 I just love that cool kitchen sink faucet!! Eeeek Erin can't wait to meet you!! the colors are so soft and different. Wow! Can't wait to go by Ben Moore and pick up a paint strip of this color! I'm going to be at the conference too! Really look forward to meeting you!! Stunning indeed..love the color against the white marble and richness of the brass fixtures..beautifully done. Such a cheery space to…glad to have found you! Please visit me, at my new blog about the building of our new home and my passion for decor/design. Hope you will stop by. Thanks for posting Erin, this kitchen is delightful! The color on the cabinets is just so soothing. Great kitchen! Love that color. 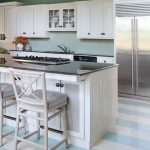 Thanks so much for featuring our project…we had some restrictions on not being able to move walls, but we wanted to create a fantastic/cheerful kitchen for the clients. We've tried to add a few more photos of some more details of the kitchen the past few weeks on the houzz site. So happy everyone loves the mix of metals and we too love the kitchen faucet. Here's a few specs on some items. Erin, sorry, hope you don't mind me sharing one more link for you and your readers…here are some before after from another blogger. Enjoy the conference! That is stunning! I love that deep, country sink. And who wouldn't love that chandelier! I LOVE this kitchen decor. It is so cozy, like a cozy cottage! Adoring this kitchen. I mean really adoring! I've decided turquoise is my best color to wear…so perhaps I need to incorporate more of it in my decor. Have fun at the conference…looking forward to all the updates! 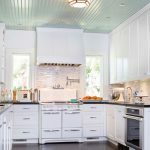 Gorgeous kitchen, I love the minty green seafoam-ish color, and the ceiling is so pretty! Love it! I want to hang out in that kitchen. Thank you for telling us the name of the color….it couldn't be more perfect….smiles. THIS IS KITCHEN HEAVEN! loveeee it! 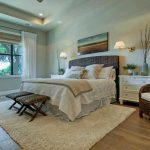 The simple white and seafoam color is great with the gold accents, it adds sophistication and looks rustic. Love this kitchen..
That kitchen is absolutely GORGEOUS! So pretty! What I wouldn't give for a tenth of this kitchen's style. oh, I love Garrison. He is so talented and super nice. It was a pleasure meeting you in LA. Best wishes with your blogs and your future wedding! I'm so proud of my friend Garrison and all his success. He was a client that blossomed into a friend and colleague. A talented man to keep your eye on. So happy to see his work going viral! I love this blue kitchen! It's such a lovely light blue, it make me want to cook! I made an article about Marrakech blue in my blog. I love the scale of this kitchen. Any chance you would have dimensions on size of this room?